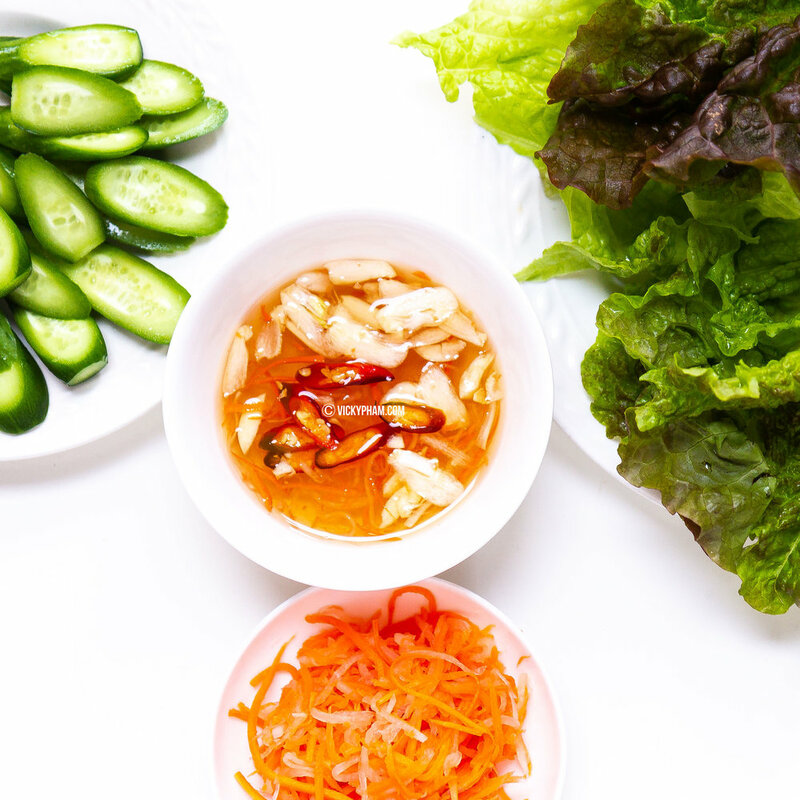 Vietnamese fish sauce dipping sauce, or Nuoc Mam Cham or Nuoc Mam Ot, is used in many Vietnamese dishes: cha gio (egg rolls), goi cuon (spring rolls), banh xeo (Vietnamese crepes), banh cuon (Vietnamese rice rolls), Vietnamese mini pancakes (banh khot), grilled meats, and many, many more. If these dishes do not come with Nuoc Mam Cham, there's no point in eating! Nuoc Mam Cham is such a major component of Vietnamese cooking that it should be a prerequisite for being Vietnamese. There are ready-made fish sauce dipping sauces readily available in stores, but the best ones are the ones you make yourself with fresh ingredients. Nuoc Mam Cham has such a delicate taste that any small addition can transform the sauce to incredibly off-putting to amazingly fantastic. Many people, including myself, frequently get the ratios of ingredients wrong. I finally turned to my cooking-extraordinaire mother-in-law for help. Her recipe is so delicious that I have seen guests slurp down her sauce. Her recipe is the perfect combination of sour, sweet, salty and spicy. Her secret ingredient? Coconut soda. My Vietnamese dipping sauce woes are now over as I finally asked her to quantify each ingredient after many failed solo attempts. Below is her recipe for the best Vietnamese Fish Sauce Dipping Sauce ever. Combine the hot water and sugar and mix until dissolved. Let it cool then add in the rest of the ingredients and mix until combined. Taste test. If the sauce is too sweet, add a tablespoon of fish sauce at a time to your liking. You can prepare the sauce in advance but only add garlic and chili peppers right before serving. Leftover sauce can be stored in the fridge for up to one month.